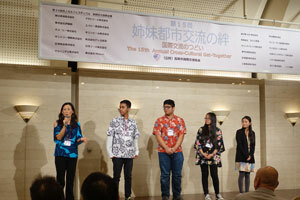 The Honolulu Festival Foundation conducts an educational program that sends Hawaiian high school students to Japan every year. 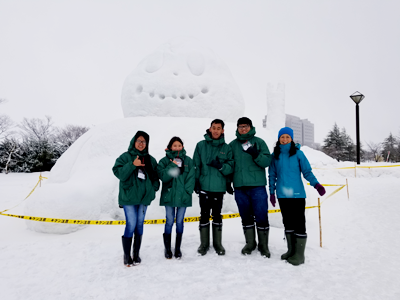 As a result of the presentation selection in 2018, we sent four students and one teacher from Hilo High School to Nagaoka City in Niigata Prefecture in Japan from February 15th to 19th. During their stay in Japan, they experienced many cultural exchanges through communication with local students, the homestay and by joining the Yukishika festival. 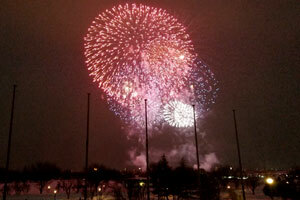 Also, they played in the snow and appeared in a radio program. The tour of the Yamamoto Isoroku Memorial Hall and the War Museum deepened their understanding of peace. They had a thoroughly filled training program. 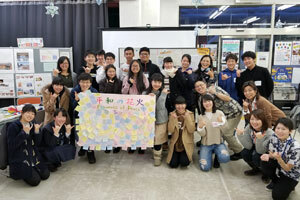 One student from Hilo High School said that they could feel the hearts of Nagaoka’s minds and the feelings of the city praying for world peace and that it had been a good opportunity to think about how they can contribute to world peace as individuals with the students of Nagaoka. The program to send high school students in Hawaii for educational training to Japan started in 2013 as a sister city partnership between Honolulu City and Nagaoka City in 2012. The Honolulu Festival Foundation and Department of Education in Hawaii cooperate together to select a representative school through their annual presentation. We have been sending over many students from Iolani High School, King Kekaulike High School, Kalani High School, Maui High School and Kaiser High School to Japan. Honolulu Festival Foundation will continue to help support and contribute to Hawaii’s youth education. « “24th Honolulu Festival” highlight video is uploaded.